Ouch! I am not a fan of his broadcasting and I was too young to know him as a ball player. But, that is just cold and mean. 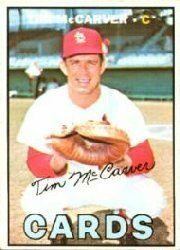 Do you think it is in the realm of possibility that McCarver is not opening his own mail especially since he will receiving the Ford Frick Award at the HOF ceremonies this year and that many are mailing him for a HOF auto? If Ford could sign for him, then really there is no excuse, but I’m just saying that McCarver might not be handling his own mail. However, I see on http://www.sportscollector.net that McCarver has employed this stunt for years of opening fan mail, taking out the cards and returning them UNSIGNED, wasting the postage on your SASE. Yes, your cards are getting returned safely. However, someone who simply marks your outer envelope REFUSED or RTS means that you can use the SASE again. And there’s no implication that your letter has been read and ignored, especially when you’re a soldier deployed in Afghanistan. McCarver is an idiot and a fool, and this proves it.